The Pontiac Catalina was a lightweight, fullsize vehicle outfitted with powerful engines offered in coupe and convertible form. Throughout its production lifespan, the mechanics and aesthetics varied. In the early 1960’s the base engine was a 2-barrel 389 cubic-inch eight-cylinder engine that produced nearly 270 horsepower. The four-barrel version raised the rating to 333 horsepower while the three two-barrel version produced almost 350 horsepower. The Super Duty ‘SD’ 389 cubic-inch engine raised the performance to over 360 horsepower. 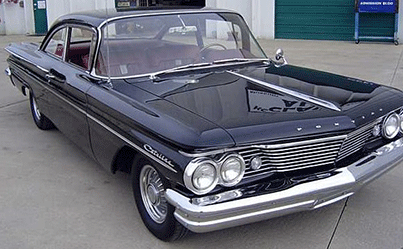 With a Borg Warner four-speed or Hurst three-speed manual gearbox, the Pontiac Catalina was a serious machine. Depending on the configuration the Catalina was capable of going from zero-to-sixty in around eight seconds with the quarter-mile run accomplished in just over 15 seconds.